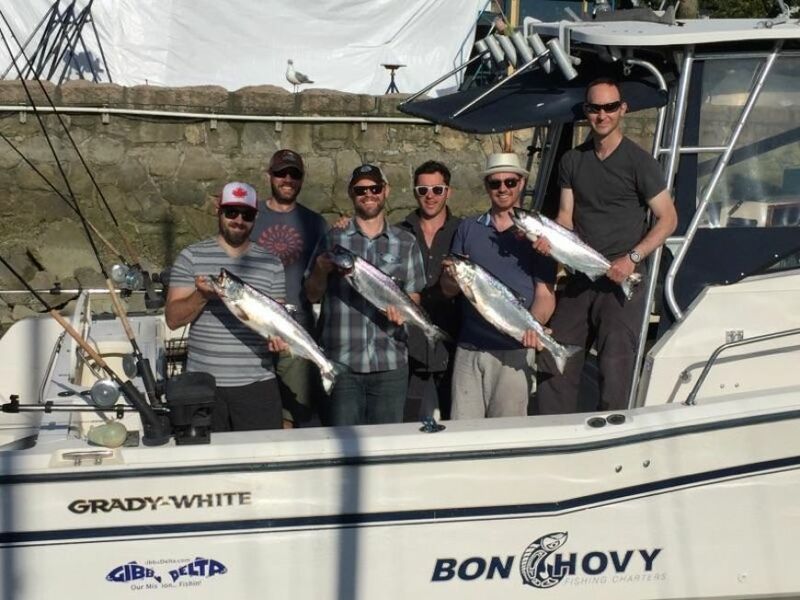 We have enjoyed fantastic weather and consistent salmon fishing in local Vancouver waters and the Gulf Island's over the last couple weeks. The fish have not been huge, but there is healthy numbers of feeding chinook in the 8 to 15 pound range. We are also very excited that the first coho have shown near Bowen , Gabriola and Galiano Island's! A very encouraging sign for coming months. In local waters, we have been spending most of our time fishing the deep waters searching for feeding chinook. Depending on the day, we have had good success off the QA Marker, the Hump, Cape Roger Curtis, Hole in the Wall and Cowan Point. The local chinook are chasing the schools of anchovy that seem to be one of their main food sources in the spring now. It is very interesting how the emergence of the anchovy schools has now changed our spring chinook fishery.....for the better!! Because of the abundance of anchovy, especially near Bowen Island, we have had really good success on Gibbs Delta Skinny G spoons. The normal productive patterns like the Outfitter, Bon Chovy and Irish cream seem to be working well as usual. Silver Horde Irish Cream, Killy Mcgee and Herring Aide Spoons also seems to be working very well. We have been running a bit of bait, but spoons have been just as good if not better. The fishing in the Gulf Island's has also been very good. Depending on the day anywhere from Active Pass up to Nanaimo has seen good numbers of chinook and increasing numbers of early coho salmon. The fish have been tight to structure and also in the deep water. Spoons, bait and hootchies have all been working. Some days they are as shallow as 50 feet down and other days we have had success dragging bottom in 150 to 200 feet. 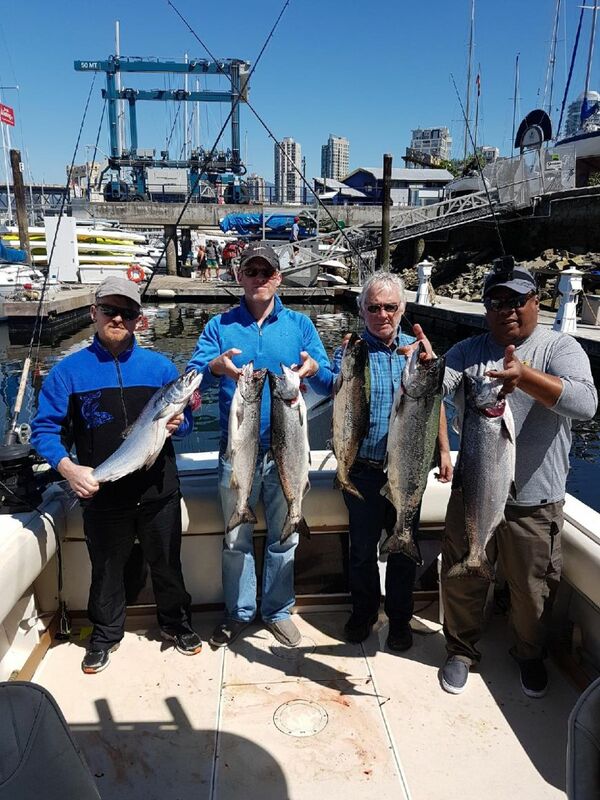 Our local guides association, "The Vancouver Sport Fishing Guides", with support from the Capilano Hatchery, has recently completed another successful chinook net pen project in Vancouver. Spearheaded by Phil Grassi, for the 10th year in a row, 100,000 chinook smolts have been released into the waters near Point Atkinson. The chinook smolts are transferred from the Capilano Hatchery to a net pen at the West Vancouver DFO labs. For a couple weeks our group of volunteers feed the young chinook daily to give them a bit of a jump start in life. Check out this video we put together with www.corbiefieldwalker.com, it shows the net pen in action and explains things in a little more detail. 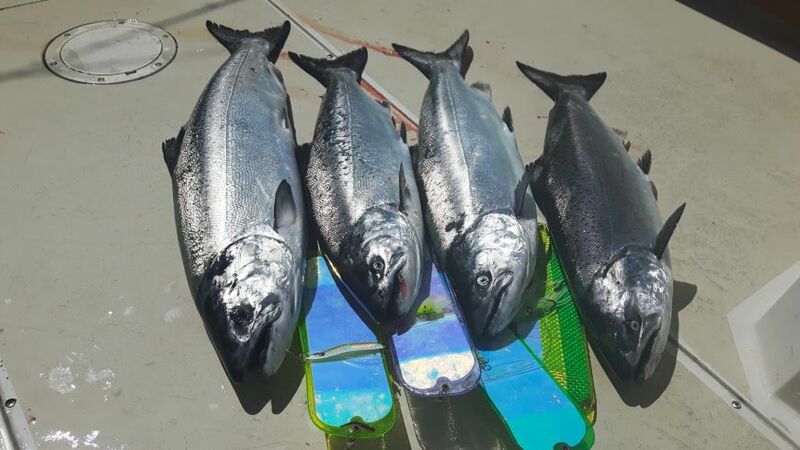 If you are looking to get out on the water, it is looking like we should have continued good fishing for chinook salmon. While there is often good opportunity on our 5 hour trips, our longer 8 hour and 10 hour trips are very good bets in June. It allows to run a little further and catch that extra tide change. On 10 hour trips, we can run over to the Gulf Island's if the fishing and weather conditions permit. Give us a call or an email to get out on the water!